Wakefield Trinity's 2019 Magic Weekend jersey. Trinity were the last side to lift the Yorkshire Cup, as the competition never made its return after 85 seasons of existence. Wakefield beat Sheffield Eagles 29-16 in the final after defeating Doncaster, Keighley Cougars and Featherstone Rovers in previous rounds. The shirt has also been produced in memory of Trinity great David Topliss. The former Wakefield stand-off made his debut for the club in 1968 and went on to make over 400 appearances for his hometown team. The Trinity stalwart passed away in 2008. Wakefield face Catalans Dragons in the opening game of this year's Magic Weekend at Anfield, Liverpool on May 25. 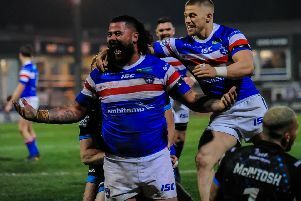 The shirt is available to purchase on the club's online store and in the Wakefield Trinity retail store, which is located in the Ridings Centre.